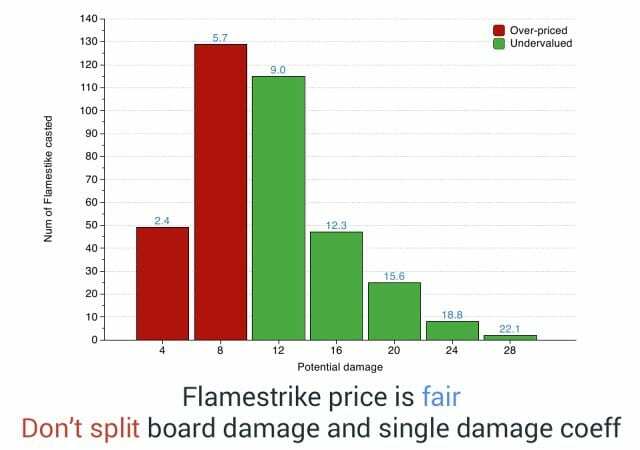 Delving further into game analysis, Elie Bursztein provides some results of modeling cards with special effects to see if they are overpriced or undervalued. So, how do you take it to the next level? Well, it’s really difficult, at least without extra data. And this extra data is how people play the game. Most of the cards depend on the state of the game, and we don’t have insight about it unless you have a lot and a lot of replays. Of course, Hearthstone being very new, we don’t have that many replays and it’s actually not a built-in feature. 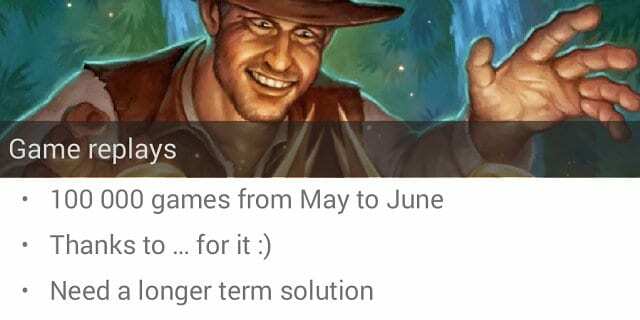 Fortunately, we got our hands on 100,000 games which were played between May and June. We’d like to thank all of our anonymous friends for that – thank you very much! It’s not a long-term solution, and we really hope that Blizzard will give us the ability to see replays so that we can do our own analysis. I know it’s in the Terms of Service, and letting people look at things should be perfectly fine. With this data you can do interesting stuff. The first one is you can actually price cards which have unique effects. Let’s start with a very simple example, the Twilight Drake (see right-hand image). The Twilight Drake is a card which is a 4-1 for 4 mana, and it has a special effect, where when it comes into play – it’s a Battlecry – it will give 1 additional health for each card you have in your hand. Obviously, the value of the card depends on how many cards you have when you play it. 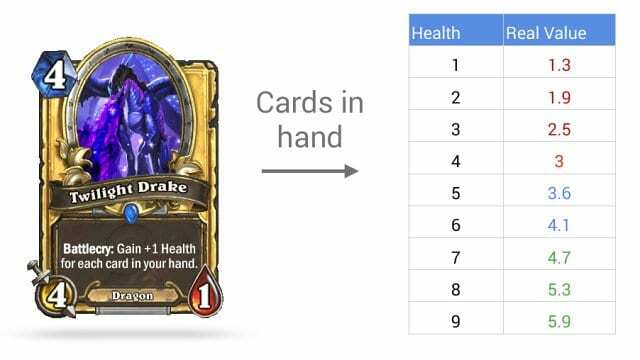 So we can build a model where you say: “Well, if I have one card in my hand, then it has 1 extra health and its real value is 1.3 mana. If I have two, it’s 1.9 mana and so forth – up to 9, where it’s 5.9.” So the question is, now that you have this table, you need to use replay data to be able to know how people play it. Are they mainly playing it with 8 cards in the hand, 4 cards, 2 cards..? So you do it, you draw this thing, and this thing is an exact graph (see right-hand image). What you see is the following: in the red on the left side, you see when people play it with fewer than 4 cards, and the card becomes undervalued. Basically, if you play with 4 cards you get 3 mana value of the card. If you play it with 5 cards in your hand, you get a 3.6 value. With 6, you have a 4.2 value. So this is a fair zone, basically. The price of the card is just right. If you play it with 7 or 8, then you get a lower value of your card. The average real value of the card is 3.7. 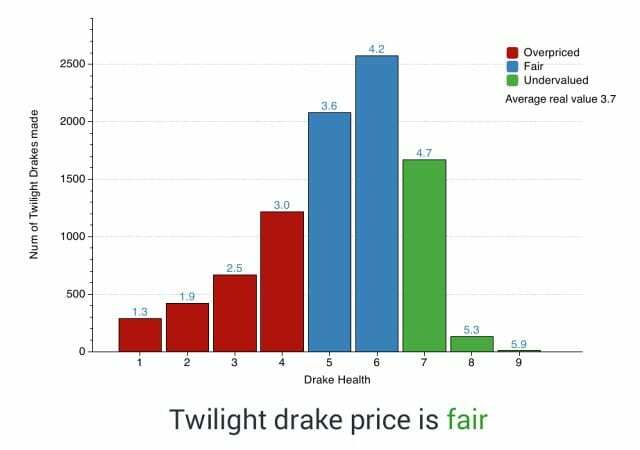 Based on that, we assume that the Twilight Drake price is fair. It’s also interesting to show that looking at this we get the same conclusion as Blizzard, so we think we have something which is very similar to what they have, except they have way better data and better insight. Let’s look at another card, which is one of my favorite cards – Edwin VanCleef (see right-hand image). What VanCleef does is it gains 2/2 for each card you play before it during a game. So all you have to do is, again, look at the replay and look at how many cards were played during the turn before it to get this value. And for a reasonable number of cards played before it – I know you can go way below that – if you have 2/2, it’s 1.09, roughly 1 mana. If you add a second card, you add 3 mana, which is roughly fair. 6/6 – you begin to get some value out of it. And when you play 5 or 6 cards, then the value of VanCleef is just outrageous. We really hope that Blizzard will give us the ability to see replays so that we can do our own analysis. As you can see (right-hand graph), VanCleef is most of the time undervalued. It is. Even if it’s a 6/6, which is 2 cards before it, then you already get, like, a 5 mana worth of your card. And for 4 cards before it, you get a 7 mana worth of your card, and so forth. So the average is 8.1. The average value of VanCleef today is 8.1 based on our data. 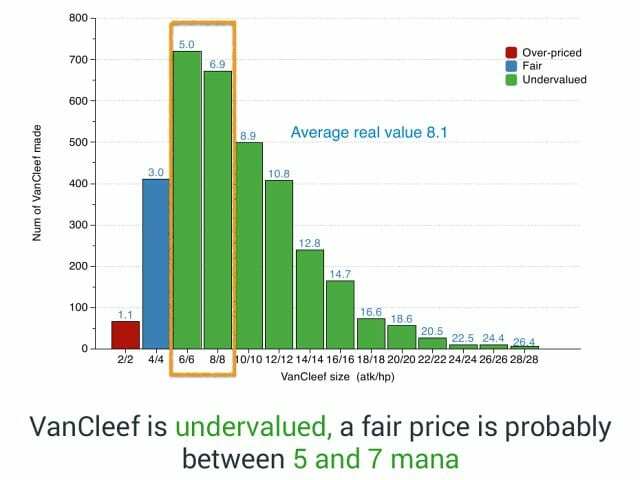 So I do claim that VanCleef is undervalued, and I believe the right value is between 5 and 7 mana. 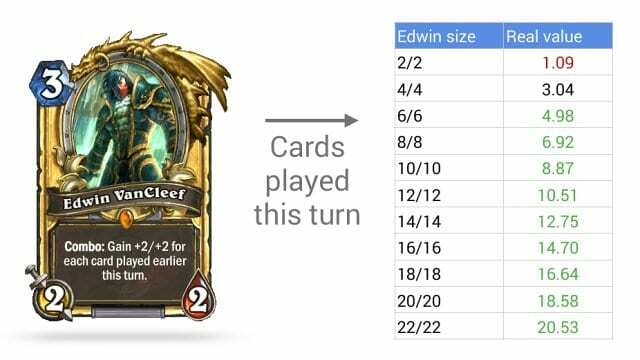 I know it would make VanCleef harder to play, that’s why I say it should not be 8 or 9. But 3, in my opinion, is way too low; according to these data, it doesn’t make any sense. So, this is probably one of the cards which are the most undervalued. Alright, the last one – Flamestrike (see right-hand image). We got a lot of questions about how you deal with AoE. Among cards which have Area of Effect, Flamestrike is one of the simplest ones. What it actually does is it does 4 damage for every minion of your opponent on the board. It’s easy, right? 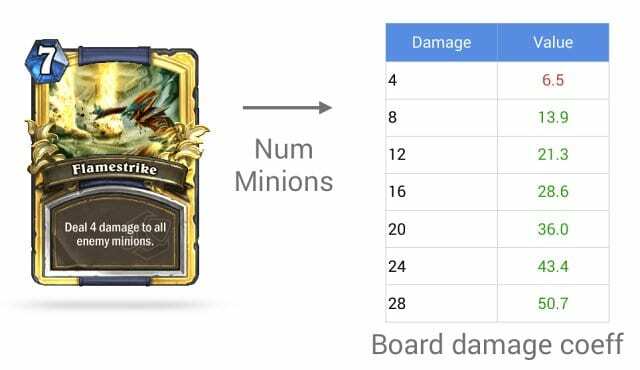 All you have to do is count how many minions you have on the board on your opponent’s side and then multiply that by the number of damage – and voila, right? So we just did that, and I look at these numbers and I’m like: oops, there’s something completely wrong here. You notice if you have 2 minions, your card is already worth 13 points of mana – hmm, the modeling is going wrong somewhere. It doesn’t make any sense; you can have a 50 mana worth of card, so what’s wrong? It turned out it’s because we used board damage. Remember I told you we tried to be clever and separated single targets versus multiple targets? And this is what happens when you try to be too clever. Okay, let’s just burn it, let’s try again and go back to single target. Now it makes more sense. 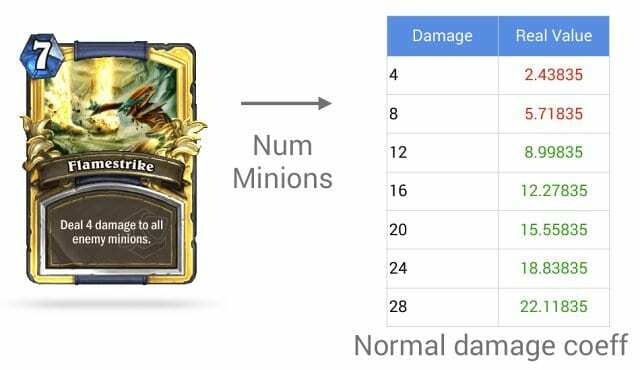 That’s how we learned that we should not choose multi target versus single target – you should use only one coefficient, which is spell damage, not two. And it actually makes sense. The card becomes a good deal when you have 3 minions on the board, and not otherwise (see right-hand image). The graph looks perfectly fair, you can see it visually (see left-hand image). Sometimes it’s undervalued, sometimes it’s overvalued, most of the time it’s between the two. So the card is perfectly balanced. And the lesson here is: don’t try to be too smart; do not split single and multiple targets. That’s one of the lessons learned. We also liked this idea, because actually looking at those cards helped us validate that what we do makes sense and everything is consistent, and when there is something strange we adjust the technique accordingly.